Jump on the funfetti bandwagon with this moist, delicious, and festive bundt cake with almond glaze. It starts with a cake mix~but no one will ever know!!! 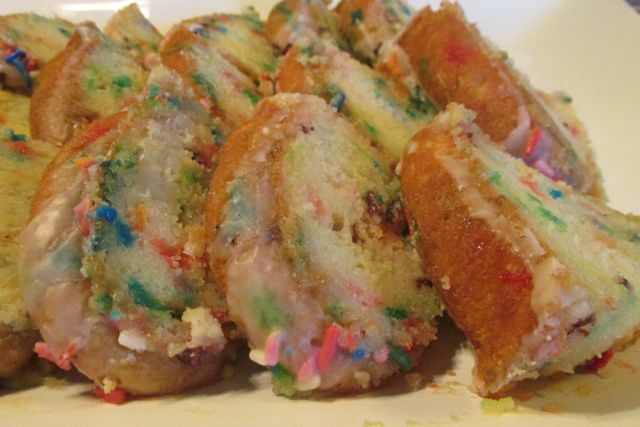 “Funfetti” is taking the dessert world, and Pinterest, by storm. A google search of funfetti will turn up myriad ways to use this sprinkle- laden batter. From funfetti brownies, funfetti cookies, funfetti bars~most anything that can be baked can be baked funfetti style! I decided to make a funfetti bundt cake and top it with almond glaze, and it was surprisingly tasty. I slightly adapted my recipe for THE BEST White Cake with Buttercream Frosting, and I made it in bundt cake form. I added an almond glaze and then topped the cake with even more sprinkles. Easy, festive, and yummy! Give this a try, and let me hear what you think? I LOVE hearing back from readers, so please leave comments! Thanks so much for reading. Be blessed, and stay savvy!!! 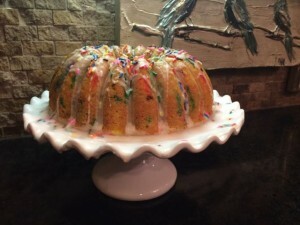 Turn a funfetti cake mix into a colorful, almond glazed bundt cake that is lovely and delicious enough to serve company! Spray bundt pan completely with Baker's Joy; set aside. Mix cake mix, pudding, and sugar in a medium bowl. Add oil and water, mixing with a hand mixer until combined. Add eggs one at a time, blending for about 2 minutes. Add sour cream; blend well until all ingredients are fully incorporated. Bake for approximately 40 minutes until cake is â€œjust setâ€ in the center (a slight jiggle is fine). Remove from pan; allow to cool 30 minutes before glazing. Mix powdered sugar, water & almond extract. Pour over slightly warm (not hot) bundt cake.